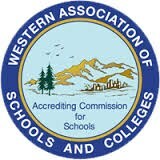 Bishop Conaty - Loretto High School is accredited by the Western Catholic Educational Association (WCEA) and is co-accredited by the Western Association of Schools and Colleges (WASC). All schools go through the process of accreditation every 6 years. The WCEA/WASC protocol E3 (Ensuring Educational Excellence) emphasizes Catholic Identity, data collection, and discussion which results in a self-study report of the school's educational improvement plans. The 2014-2015 school year marked an accreditation renewal year for BCLHS. Bishop Conaty - Our Lady of Loretto High School received an Accreditation status through June 30, 2021.